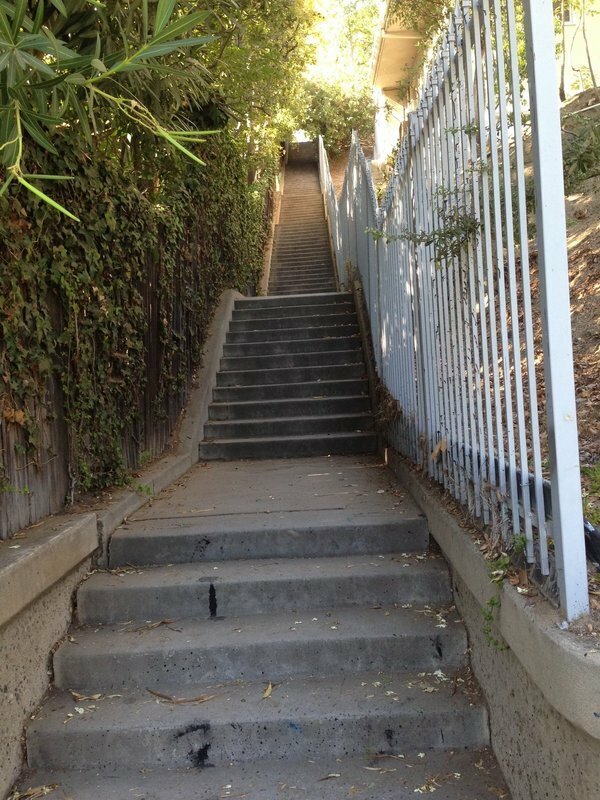 Both the Berendo and Glendower Stairwalks are tucked back into a fairly ritzy part of Los Feliz just north of Los Feliz Blvd. There are some seriously swanky homes around here, but these steps definitely retain a healthy amount of public grunge. Just like Micheltorena, there’s a little sitting area with benches halfway up, which would be a nice place to read a book if it weren’t for all the beer cans and graffiti. Don’t get me wrong—I like graffiti when it’s creative, but this was just some kid’s lame tag. Then when I was exiting the stairs on Cromwell, I passed by a little group of high schoolers smoking weed! Kinda cute, but honestly not the kind of thing that made me want to come back to this one any time soon. I’d much rather revisit the “Glens”—Glendower and Glencairn—a little bit up the hill. The one cool thing about Berendo though, is the “astroturf garden” about halfway up. It’s like somebody started to build a mini-golf course in their backyard, laid down sheets of green fuzz on several different levels, and then just said screw it (or ran out of money). Hey, what can I tell ya-- there’s some odd characters in this town!